We’ve found it’s not a single product, but a perspective that requires a shift in thinking about how to get the most out of your network infrastructure investment. B+B SmartWorx, a worldwide leader in Intelligent Industrial Network Connectivity, announced the launch of its new, energy efficient, eWorx family of Smart Switches designed for Industrial Ethernet applications. The first product line releasing today under the eWorx label are the SE300 series, a new class of monitored switches. 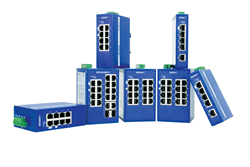 Visit http://www.advantech-bb.com/eworx-switches to find out more about the eWorx 300 Series.